Surrey/Fraser Valley – FVN Fraser Valley News is a proud sponsor of Surrey Cares and their Community Awards. FVN’s Managing Editor Don Lehn will once again MC the annual awards gala (which is free ) at the Surrey Arts Centre, November 19. The new Surrey Youth Vital Signs 2015 study by SurreyCares Foundation leveraged a city-wide opinion survey of youths to inform a broad range of research that identifies issues of relevance for Surrey youth and priority areas to improve their future. Four hundred youths aged 12-to-24 aided the study and expressed satisfaction with most elements in their city, including growing cultural diversity. 53% of youthful survey respondents said they were satisfied or very satisfied to live in Surrey. However, youths also expressed wishes for improved transit, education and employment to enable more successful transition into adulthood in BC’s fastest-growing city. “SurreyCares is thankful for the involvement and inspiring advice from Surrey youths and partner organizations to identify issues of key relevance to strengthen the futures of youths,” said Jeff Hector, Chair, Board of Directors, SurreyCares Foundation. 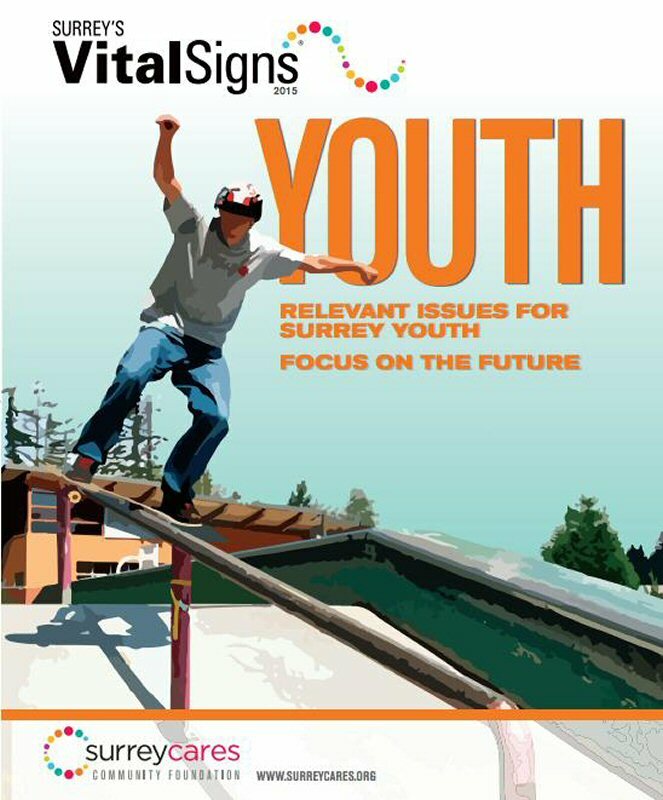 Surrey Youth Vital Signs 2015 and other resources are available online at www.surreycares.org. Surrey is a young city that is home to 22% of youths in Metro Vancouver and also home to the largest number of children and youth in BC except for City of Vancouver. 44% of Surrey youths over age 15 volunteer in the community. 31% of survey respondents chose more funding for post-secondary education as top topic for improvement in education. There are 12.7 post-secondary spaces per each hundred 18-24 year-olds in South of Fraser region. This is nearly one-quarter of the rate of 48.7 in rest of BC. 2% of Surrey residents are Aboriginal. Because nearly a third of aboriginals are under 15 years old, the 3,240 aboriginal youths attending school in Surrey are the most of any BC school district. 29% prioritized greater support for youth living on their own. 25% prioritized greater funding for housing for single-parent families. 23% prioritized more long-term living arrangements for youth. Vital Signs is a national initiative by Community Foundations of Canada that combines statistical data and public perspective into community reports on issues of importance to residents. SurreyCares released the city’s first Vital Signs report in 2014. The 2016 survey and report will focus on Newcomers, including immigrants and refugees who are a significant portion of new residents for one of Canada’s fastest-growing cities. SurreyCares Community Foundation strives to make Surrey a stronger, more vibrant community. The charitable non-profit society draws community service agencies together to jointly exchange ideas, support, energy and encouragement to improve the quality of life for Surrey residents. The Surrey Youth Vital Signs 2015 report and presentations will be available online at www.surreycares.org. Coast Capital Savings is the Premium Sponsor of the 2015 Vital Signs report and one of the largest employers in Surrey. Through its “for youth, by youth” community investment program, Coast Capital makes significant contributions to build a richer future for youth in our communities. Be the first to comment on "Surrey Cares Report- Youth Needs Better Quality Of Life"